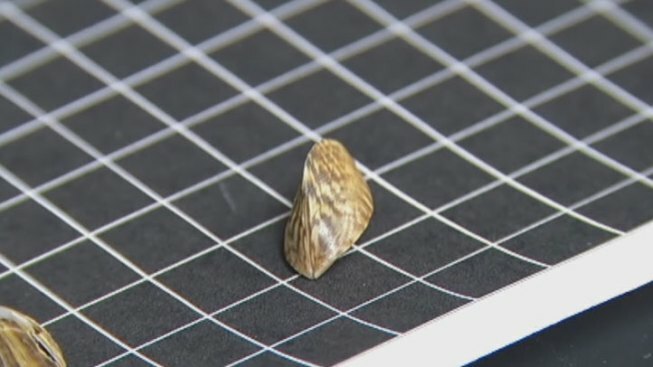 Students at the University of North Texas have discovered the invasive zebra mussel in the Trinity River. University of North Texas biologists say they have found zebra mussels in the Trinity River in Denton County, less than a year after the invasive species was discovered in Lake Ray Roberts. The first sample was found during a research trip by several biology students. Senior Bethany Hambrick made the find under a rock about a mile south of Lake Ray Roberts. "I was looking for fossils and fresh water mussel cells and picked up a rock and I knew that the morphology was not anything that I'd seen before,” she said. "I had a suspicion it was a zebra mussel, and that was sadly confirmed." Large colonies of the species were discovered in Lake Ray Roberts last summer and at Lake Texoma about three years earlier, but this is the first time any have been found in a Texas river. "I think it's inevitable that they’ll continue downstream,” said James Kennedy, a UNT biology professor who's closely monitoring the zebra mussel situation for the state. "You can treat zebra mussels in confined regions, but to go out and try to treat and manage a river system like the Trinity River watershed is going to be practically impossible." From a biological standpoint, zebra mussels are dangerous to Texas’ waters because they are too efficient at cleaning and filtering, he said. "They pull particles, algae, microscopic plants out of the water, particularly the organic matter out of the water, which is the basis of the food chain for fresh water ecosystems,” he said. The bigger problem with their presence in the Trinity River is that it’s such a major source of water for the area. The mussels clog water intake pipes, making it difficult to move water to reservoirs. They could potentially have a huge effect on the cost of fresh water, Kennedy said. "They have to be mechanically removed because these mussel shells attach themselves very tightly to the pipes," he said. They also harming boats and motors left in infested waters, and the sharp edges of their shells can injure swimmers and other animals in the water. "It is a very severe situation,” Hambrick said. "We're basically at this point just cataloging them. We put them into a database and we photograph them," grad student Colleen VonEhr Evans said. "It gives us a better idea of how quickly they're going downstream." For now, UNT will continue to monitor the waterway to track where the mussels move. Officials with the Texas Parks and Wildlife Department say the species can be spread from lake to lake by boaters who don't properly clean their watercraft between lakes. The department launched a public education campaign last year to encourage lake users to clean, drain and dry their boats, trailers and gear. Kennedy said the invasive species originated in the Balkans and was brought to the Americas more than 20 years ago, likely attached to a ship in the Great Lakes. They were first spotted stateside in Michigan in 1988 and have since spread to 29 states and more than 600 lakes and reservoirs.